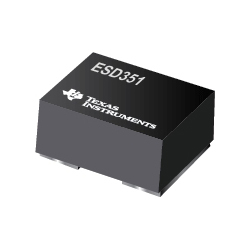 The Texas Instruments ESD351 is a uni-directional TVS ESD protection diode featuring low dynamic resistance RDYN and low clamping voltage. The device is rated to dissipate ESD strikes up to 30kV (Contact and Air) level per the IEC 61000-4-2 standard. The ultra-low dynamic resistance (0.1Ohm) and very low clamping voltage (6.5V at 16A TLP) ensure system level protection against transient events. This device has a capacitance of 1.8pF (typical) making it ideal for protecting interfaces such as USB 2.0. The device is provided in the industry standard 0402 package.